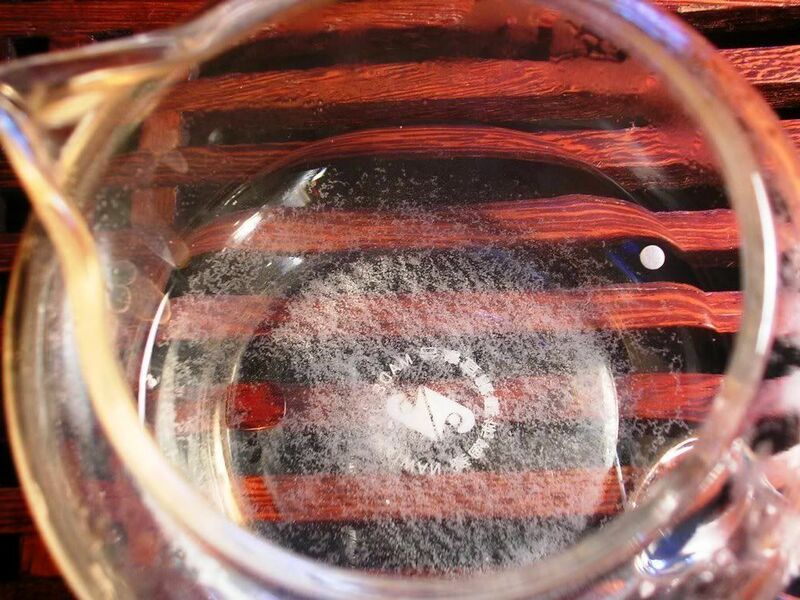 This sample comes from the Awazon Tea Co., via the plentifully shengtastic auspices of VL - thanks, as ever! Awazon is a non-standard rendering of "Awashan", the region in southwest Yunnan around the Lincang area, home to the Wa minority. Not only is Awashan, as far as I can tell, a region, it is also a mountain (pictured below). Information about this tea company is non-existent, and I would welcome anything readers might be able to offer. They make their own bingcha, but there seems to be no consist region: some comes from the Menghai-area, some from Bulang, some is simply designated "Yunnan" - a bit like "Bordeaux" appellation wine, being the lower-quality catch-all. 20cl shengpu pot; Evian @ 100C; two "pinches"; 1 rinse. Long and natural, pressed together like matted clumps of dog-hair. 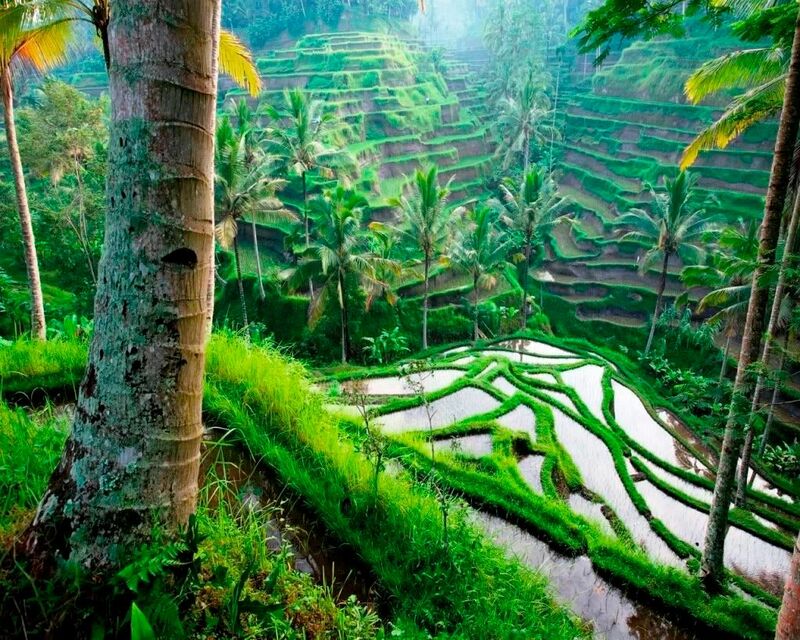 Tippy and green, befitting its youth and unprocessed nature. VL warned that this is potent, and so I'm conservative with leaf. Pale yellow. A short, sharp shock of sour grapefruit in the beidixiang, and then instantly nothing. My initial fear of overbrewing led to far too much conservatism: we ended up tripling the quantity of leaf to reach a good strength. It seems almost impossible to overbrew this tea, in fact, reminding me of some roasted wulong. There is a good texture to this tea, feeling smooth in the mouth, but absolutely no flavour except for considerable sweetness married with constant sourness. The aroma is eternally limited to three seconds of medicinal camphor aroma; I defy anyone to get more enduring aroma from this leaf. The lengxiang is merely... warm air. So beautiful, I don't believe that the photograph does them justice: whole, appealing leaves, with a touch of red oxidation about the edges. Excellent hand-picked stems, with a fair number of tips presumably contributing to the smooth texture. This is, perhaps, the most one-dimensional shengpu I have encountered: it is nothing but that constant sweet-and-sour flavour from beginning to end, with absolute repeatability and consistency. This tea is a blender's dream: it is like a tube of reliable single-colour paint, from which a more colourful result might be obtained through combination with other colours. Behaviour throughout the nine infusions was constant. The lack of interest in this tea, the thinness of character, makes us wonder if this is evidence of overfarming. It is about as complex as rock (geologists - let's pretend rocks are not complex, for the purposes of illustration). Fascinating. Not excessively enjoyable, but fascinating. I recently received an e-mail from Lisa, of TeaCuppa.com, who is keen to support a community tea-tasting event. Given the previous success of such tastings, I felt sure that this would be something that the community would enjoy. To that end, I would very much appreciate it if you would cast your eye over the following, to see if you're interested. i. Samples for this event will be sent out within the next week. Please only commit to joining if you are able to taste and review the six samples within two weeks of receiving them. ii. Please e-mail your notes to me, so that I can draw the opinions together. You're free to post on your own sites, if you have them, whenever you wish. iii. Don't worry if you can't match samples to the actual bing - the goal is not to compete, but to have fun in the event, and perhaps learn a little. The real aim of this exercise is to see how these teas hold up to anonymous scrutiny, to see how we variously and individually examine teas, and to determine what consensus decisions (in any) we can find for these teas. iv. Please contact hobbesoxon AT googlemail DOT com if you would like to take part. 10 places are available in all, some of which have been nepotistically filled by those whom I've already e-mailed [evil grin]. Update: the available places have been filled; thanks for all the e-mails! Individual responses have been sent to each. Neither Hobbes nor the Half-Dipper has any connection with the sponsors; this event is arranged entirely pro bono publico. Samples will be sent directly from Lisa @ TeaCuppa. There is no charge for this event. Before today's main post, a few follow-up photographs relating to other threads in the Blogosphere. 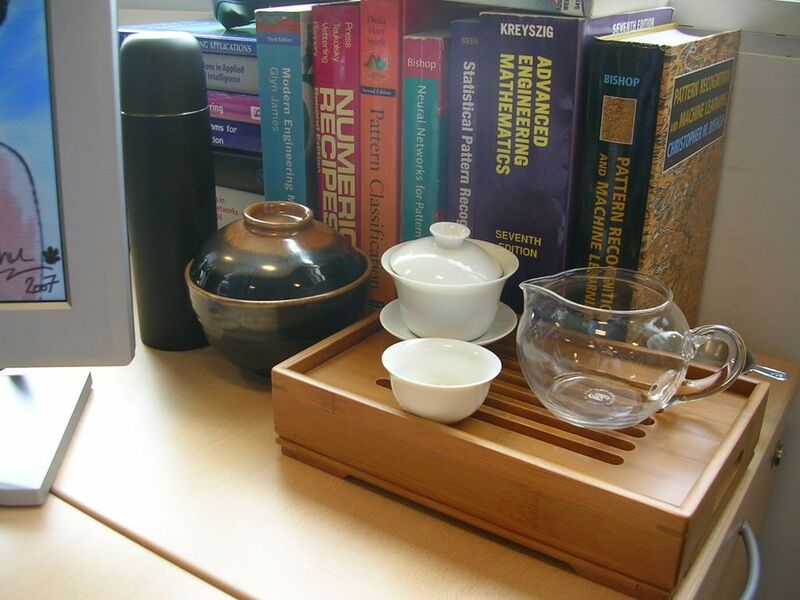 In a previous thread, we were discussing a small tea-tray, of the type suitable for use at work. Firstly for VL, a quick example of the little fellow in action, stowed in the corner of my office. This location near to my books has the great benefit that, on the frequent times that I'm enjoying a gaiwan of decent tea while about my work, it actually looks as if I'm being erudite and consulting a tome (which, of course, is far from the truth). Taking a leaf out of your book, VL, I'm using a thermos of water to brew the tea. It's not quite hot enough for serious pu'er, but it's close - especially if your mind is elsewhere. 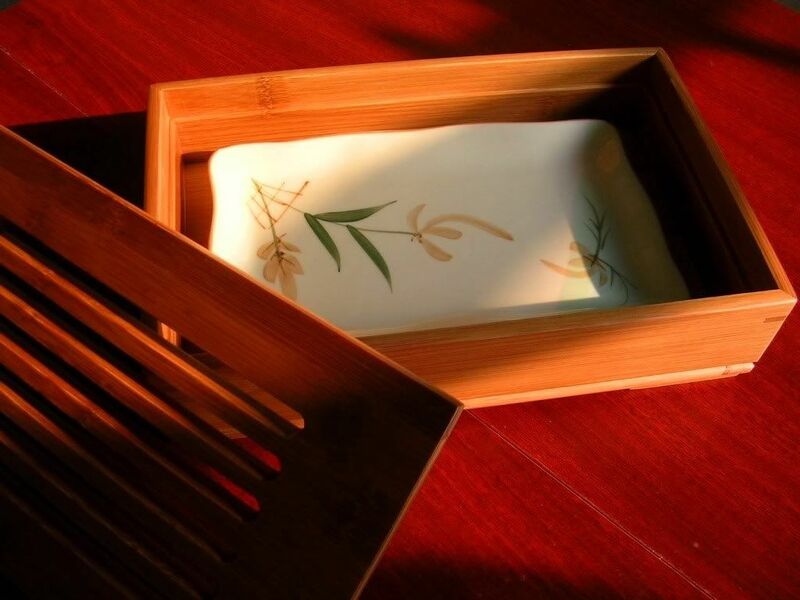 It's a simple porcelain tray, that catches the drips from above. This does mean that one cannot indulge in the "fun splashies" that DogMa rightly referred to recently in the rec.food.drink.tea forum, but I tend to be conservative with my water usage while working, and the tray seldom gets more than half-full. This has the obvious advantage that the bamboo box doesn't get wet, and so should last a little longer than otherwise. Distinctly unpleasant. I don't like the idea of that being ingested - it looks roughly as bad as filtered local tapwater (but tastes much "higher"). What I couldn't capture in the image were the pronounced streaks of white residue dribbling down from the spout and sides - Evian is not recommended! To celebrate the coming of 2007, we're drinking up our 2006s - much like everyone else, I imagine. 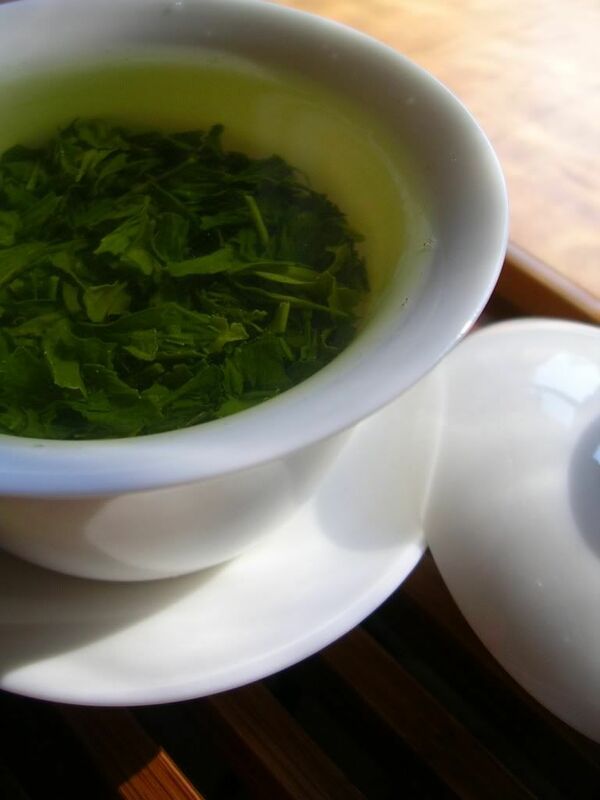 This sencha is one we've enjoyed before, but hasn't yet made it into the Half-Dipper archives. It's from Kaori teas, in Covington, Kentucky, and arrived with us courtesy of CB - thanks again for the sample! 9cl gaiwan; Caledonian Springs @ 80C; 2 scoops; single rinse. Very sharp and brittle needles of tea, with that glossy sencha shine. A nutty aroma. The "Hachiju hachiya" name allegedly refers to the fact that they were picked on the 88th day of spring, traditionally considered an optimal time for gathering. These tasting notes come from my journal archives, back when this tea was a little closer to that optimal freshness. Cloudy yellow soup. This is, perhaps unsurprisingly, a very fishy tea. "Tender and creamy", says Xiaomao, "almost like porridge". It ends on a pleasantly sour note. If you're familiar with Chinese seaweed (the actual waterborne plant that grows in thick strips, rather than the curly "seaweed" cabbage that one finds in Chinese restaurants in England), then you're already familiar with this tea. It's like drinking seaweed. There is a delicious oiliness about the texture of this tea. This is fine sencha. Surprisingly, it held its flavour well between the original tasting (December 2006) and recently. The 88th-day picking is listed by several vendors as its superior grade of sencha, and there certainly is a specialness about the definition of this tea's flavours. Not unusually, this tea faded after the third infusion, but was fresh and delicious up to that point. 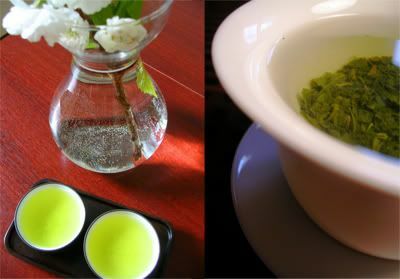 I recall an article at Rec.food.drink.tea searching for a "fishy" sencha: this is definitely for you, lovers of sea-tea. We found this sencha to benefit from a decent heat, perhaps 85C, which is against the grain of traditional wisdom (60-70C is usually recommended). 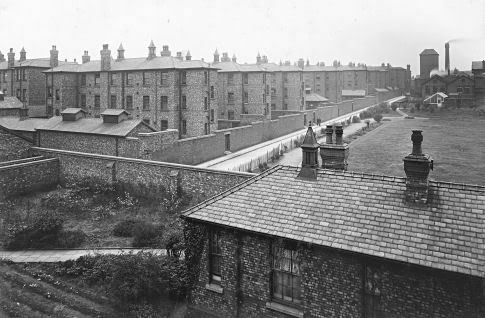 I find myself held away from home, tonight, spending two days in a far-flung Northern city (Derby) on a research trip. This wouldn't be too bad were it not for the fact that this city is rather unpleasant. It's like the more industrial parts of Beijing (heh). I apologise to Derby residents for slandering their hometown. On the plus side, there is a good curry-house nearby. Sometimes I wonder how British people coped before our time in Colonial India - curry is modernday social glue. Tea-drinking tonight consists of some Anxi Sezhong ("Colourful Type") that I slipped into my briefcase, brewed grandfather style in my hotel room. I will spare you the tasting notes - this coffee cup and hotel kettle-water are not doing it justice. More on my return to civilisation. Spring is most definitely with us. Merely opening the lounge window results in the beautiful scents of flowers; it is as if this city, with all of its traffic problems, has suddenly decided to bloom. It doesn't shout to make itself known, it just is, almost overnight, quietly transformed into a thing of beauty. Today, it's shengpu - thanks to VL for this sample. It's the 6FTM standard label, indicating that this is likely to be an unspecified blend of varying plantations and grades. We're out of our usual spring water for today, and so we're using Evian. It will be interesting to see how a high-note emphasiser like Evian will affect the young shengpu. A pretty mix of decent, whole leaves, mainly of smaller grades, with a sizable number of silver tips, happily enough. There's even a small tea-fruit, which looks very much like a clove. Yellow-orange, with a very dirty first infusion. The soup is filled with silver fur, but there is also a fine sediment at the bottom of the gongdaobei, which vanishes after the first infusion. Perhaps a shupu-style 2 rinses will be required for this, next time. There is a tangy, cigar-like note running through the beidixiang, which is present in the aftertaste. Immediately, the presence of several competing flavours is apparent, a jumbled collection of various experiences reflecting the presumably mixed nature of the bing. Lots of oil, coating the lips and tongue with a smooth sensation that lasts for the first few infusions. This might well be due to the presence of tip-fur, as the oleaginous sensation dies away as the soup contains less and less fur with successive infusions. The smoothness reminded me of the tippy hongcha from YS, that we encountered a while ago. Some chopped, a lot of whole leaves, but all rather small. Signs of some low levels of oxidation in the red colour about the edges of the leaves, as befits its younger age. Some tips, looking very much like the zhuyeqing tips from neighbouring Sichuan plantations. Strong, simple, with benefits of its tippy character fading after the first few infusions. This tea delivers a punch which has to be controlled - erring on the side of caution with infusion times is the only way to avoid a brew that can be rough in the throat. Later infusions see this roughness taking precedence over the broad array of corn- and malt-like flavours from earlier brews. Be conservative with this one. Much like the 2006 6FTM, it has the potential to get very frisky, very quickly. The Evian is a good match for this tea, taking away some of the bass-note roughness, and emphasising what little top-notes are present in the aroma and flavour of this unambiguous and up-front tea. Last Sunday at Mass in the college chapel, eyes closed, my senses were filled by fragrant smokiness from the incense, and light floral aromas from the bouquet at the end of my pew. Today's tea reminded me a little of this experience, of fragrant smoke and crisp flowers. This is a sample of a Fuhai [blessed-sea] Factory shupu brick from Teamasters - thanks to SE for this little treat. 10cl "Xishi" shupu pot; Caledonian Springs @ 100C; 2 scoops; 2 rinses. Well-pressed; a great deal of small leaves - SE lists this as a grade 1-3 brick. Oddly enough, it does seem to make a difference to this brick, as we'll cover below. The infusion times alone should tell you that this tea is enduring. Most shupu has let go a lot earlier, requiring greater times between infusions. This trooper of a tea keeps soldiering on... long past my capacity to consume any more tea had been reached. The clarity is excellent, in both colour of the soup, and the definition of the aroma and flavour. The aroma opens with gentle sweetness, ending in a medicinal lengxiang that leaves my mouth watering. Full, sweet, and broad flavours, with that gentle tang at the end of the aroma making itself known in the aftertaste. Like the Lincang bing from a few days ago, this is vibrant and thrilling in its energy. It truly is effervescent on the lips and tongue. Xiaomao likens this to the "alkaline" flavour of baking soda in Chinese steamed buns. It rings with a little freshness that is almost metallic, but in an energetic and full way - I dislike actual metallic flavours, mostly noticing them when I overbrew. By the second infusion, the lighter orange soup has plummeted in colour to a rich claret, and there the colour stays for the remainder. The flavours are precise and definite, while the aftertaste rewards attention: it is a quiet "bookishness" that very much appeals to my sensibilities. Without full attention, it would slip by unnoticed. This tea is tenacity redefined: in colour, aroma, and flavour, there is little variation over the latter eight infusions that I explored, but it walks a hundred miles. It is not a complex tea, but more fresh and bright than is often found in the sometimes "muddy" shupu genre. The vibrant energy is really quite pronounced, and I wonder if this is attributable to the smaller, younger leaves used in its creation. The high compression is definitely on its side for the endurance, and doesn't appear to hinder the release of flavour. This one almost drives itself. Even after ten infusions, I was enjoying a spicy raisin aroma and full flavour - with that aftertaste that slides quietly through the nose without fanfare, but which is worth observing. Xiaomao and I surprised ourselves with this tea, as we decided to get a brick for ourselves despite a previous "no more shupu" mandate of a few weeks back. Very decent. I can see, if one is in a rush, this tea would seem very ordinary. It pays to keep an eye on this one. From Royal Tea Garden (RTG), these samples arrive courtesy of CB - many thanks! In fact, they are two of a set of six samples, the remainder of which will appear as we taste them. Dancong, of course meaning "single bush", refers to the ideal that one tea derives solely from one bush, without blending leaves from its neighbours. As with many pseudo-appellations in the world of tea (e.g., the infamous "thousand-year-old wild trees" from pu'er), it is used in an uncontrolled fashion, and can be unreliable. These teas originate from the Fenghuang [Phoenix] mountain area of Guangdong Province, which often causes Western vendors to sell them under the name of "Phoenix Soandso". This tasting comprises a Songzhong ["Song-dynasty type"] tea, referring to its derivation from either original Song-dynasty plantations, or plantations created from offcuts thereof. Again, take this as a guideline rather than a guarantee. For comparison comes Wudong Baiye ["Wudong mountain White-leaf"]. Both teas appear at the upper end of RTG's pricing scale. The Songzhong and Wudong Baiye will be A and B, respectively, and appear in photographs upper and lower, respectively. 10cl gaohuo [high-fire] wulong pot; Caledonian Springs @ 90C; 2 scoops; 1 rinse. A: 3cm, dark, little aroma. Very staid. B: deep chocolate in colour, darker than A. Typical roasted aroma. A: An interesting yellow-peach colour in the soup, of fine clarity. Smooth fruity beidixiang turning into a lovely sweet-sour lengxiang. This is gentle and smooth, with almost no bite. A gentle note of sourness runs throughout, which is a welcome contrast to the light, fruity aspects. The roast (not heavy, by any means), is evident in the aftertaste. There is a final tang akin to a decent dark chocolate, the only evidence of roasting in this highly sweet tea. B: More yellow in colour than its cousin. It has the fruits of the other, but appears a touch spicier and more sour. "More complex; higher, more mature aroma." It carries the sourness of tealeaf, with a hint of coffee in the mid-taste. There is a hint of dryness in the finish that one would welcome from a fine white wine. "A twist of elegant creaminess." A: Not a great grade, consisting of large segments of larger leaves, with a fair number of bare stalks. The leaves are difficult to unroll, and crumble easily due to their thinness. B: A fair grade, compared to A. Very green, with a sharp transition to the red oxidised edges. A: Fruit excellence for the first few infusions, fading rapidly around the 4th infusion to a pleasant background of gentle, sour flavours, at which point the roast takes over. This is a stable, robust tea, built of stable, robust leaves, which exhausts its delicate brilliance a touch too early. B: Complex for the first few infusions, with spicy fruits and butter, balanced with a complementary roast. The entire spectrum of flavours of this tea gradually dims with time, rather than rapidly losing any one aspect. Some teas collapse in one part of the flavour, while this is more a graceful and gradual recession into the water - indicative of a skillful balance of roast and oxidisation on the part of the producer. Enjoyable. From Teamasters, of unknown Mainland producer, this shengpu is from the Lincang area. In a previous topic we discussed the terroir of Lincang. What characterises it? Maybe this tea will help us find out a little more about this unfamiliar region of shengpu. 15cl shengpu pot; Caledonian Springs @ 100C; 1 rinse. Stephane recommends longer infusion times for this. 2 scoops. The compression of this bing must have been loose, as this looks like maocha. Some dark leaves, some green, with a few silver tips. It looks very decent indeed, with long sections of leaf and robust colours. The aroma is energetic. Very clean yellow soup, with a fair quantity of fur testifying to the tippiness. Long, zesty, and fresh in the wenxiangbei. A little more brown in colour, when poured into the pinmingbei. I am pleasantly surprised to see that I have slightly underbrewed this young leaf - usually the reverse is true for young shengpu, leaving a bitter first infusion. It is smooth, flavoursome, with a well-balanced ku at the end. Remarkably, it is almost effervescent on the lips, tongue, and cheeks. Very pleasant, very bright. My mouth is buzzing from energy: I can feel a low-amplitude, high-frequency vibration. Luxurious. Up to 10cm in length, and largely whole, these leaves feel like silk. 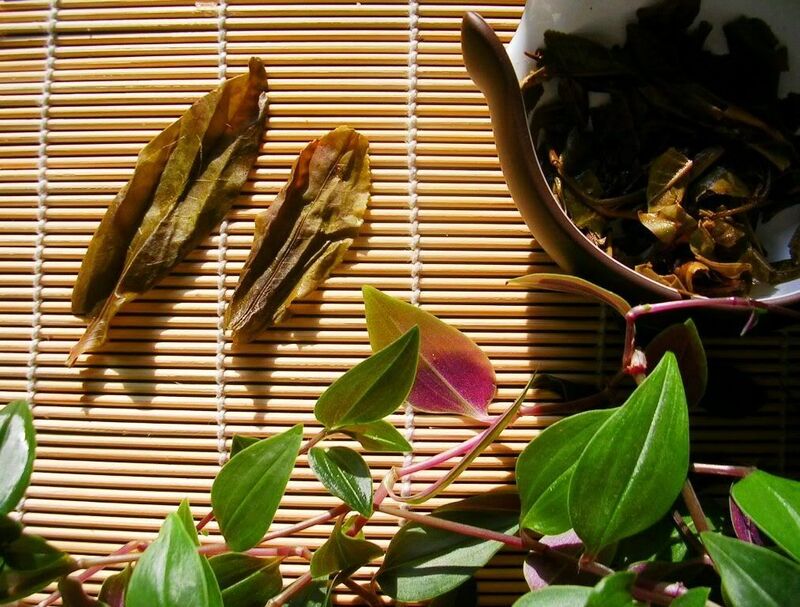 The spring leaves are often thin, and this tea is no exception. The colour is fine. Two types of leaves appear to form this tea: some are perfectly smooth at the edge, while others are serrated (see photograph below - click for an enlargement). A very fine young shengpu, with enough punch to perhaps indicate potential for aging. 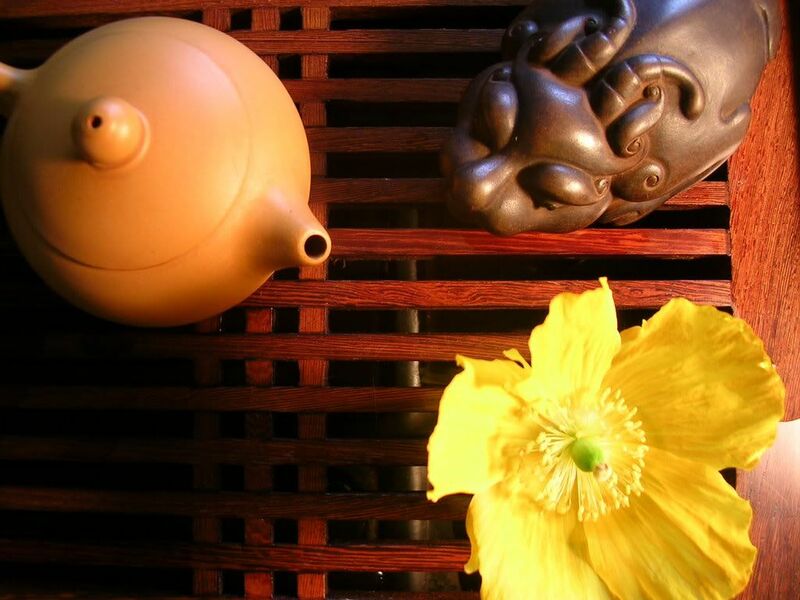 The most remarkable aspect of this tea is the vibrant energy felt throughout the mouth. It is a robust and stable tea, not varying in any great extent over the course of the session. Refreshing, enjoyable, and well-made - but by whom? I don't feel confident in being able to define the Lincang terroir, but we enjoyed getting a step closer. Thanks to Dr. Bushberg & Co. at T-Ching for arranging this tasting of the fresh 2007 shaded-growth Japanese teas. Grown relatively low-altitude (compared to other major tea-growing nations), the leaves flush under shade for the final few weeks before picking, allegedly to emulate "wild" growing conditions. I'm not clear of the relationship between Tenbu [tianwu? / heaven-dance?] and gyokuro [luyu / jade-dew], excepting the latter's infamous rarity, and its primary retention for the Japanese market. Received wisdom has it that gyokuro and its ilk should be brewed at particularly low temperatures (50-60C), with a surprisingly large leaf-to-water ratio - large even by gongfucha standards. The first infusion is traditionally held much longer than usual, for reasons that I could not uncover. T-Ching has recommended infusion parameters (I believe passed on from the distributor) in line with this: 3g of leaf to 200ml of water; infusion times of 60s, 15s, 15s, 15s, 30s, 40s, 60s at 60C. Following Sandy's request that we attempt brewing with the suggested parameters, our first session obliged (using a little less water), but the results were poor. I will be the first to confess that Japanese tea and its brewing is something with which I need more practice. For the second session, which yielded particularly pleasant results, I reverted to familiar Chinese gongfucha-style parameters: 1.5g leaf in a 100ml gaiwan, water at 60C, with infusion times 2s, 8s, 16s, 30s. 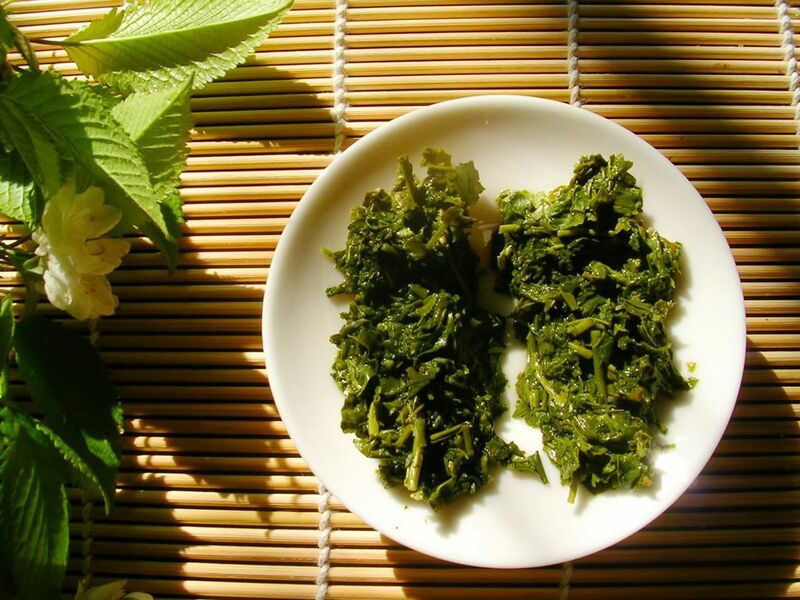 Given the immense amount of chopping that these Japanese teas undergo, it is reasonable to assume that they obey similar laws to chopped hongcha: juices, exposed during the chopping process, are dried onto the outside of the small leaf segments, which rapidly make their may into the brew during the first few infusions. Thus, brewing Japanese teas via Chinese gongfucha methods, we find that the first few infusions are most flavoursome, with a rapid decline after the second. Also, this immediate solubility of the dried juices from the chopped leaf surface results in particularly potent first infusions; we keep the first few brews particularly short in order to avoid excess bitterness. Furthermore, we perform no rinse, in order to avoid discarding all of this dried leaf-juice before tasting. Results are pleasant, but I suspect not what might be achieved if we had more familiarity with Japanese brewing styles. Throughout this article, the Tenbu and Tenbu Fuka will be designated A and B, respectively, and appear in photographs left and right, respectively. Excellent reviews of these same teas may be found at palatabilitTEA, Tea Nerd, and the aforementioned Palais de Doddy. Method: simultaneous comparison in 2 gaiwan-gongdaobei sets; Caledonian Springs @ 60C, no rinse. A: finely chopped, rather dark and homogenous with the occassional twig that appears to have survived the ubiquitous industrial chopping process. Light, grassy aroma. B: similar, if a touch darker, with a lower bass aroma - also containing a little of the "fishiness" that is sought after by some. From the appearance and aroma of the leaves, we wonder if Tenbu Fuka is a larger-leaf, perhaps lower-stalk, variety, compared to Tenbu. Web-based information on this seems limited. Tea A appears particularly lime in colour, captured well by the imfamous Dodd photograph, while B is more yellow/green. Could this confirm the suggestion that A is a lighter, tippier grade than B? A: a creaminess in the mid-taste that melts into a light, fresh grassiness of flavour and aroma. This pollenated grass sits in the nose for the long, enduring aftertaste. A hint of roasting, and a touch of welcome sourness near the finish. B: Similar in fresh grass to its cousin, but with a richer, deeper base with a constant, gentle aroma and flavour of fish. This is a calming tea, in comparison to the brightness and energy of A. Both teas perform similarly in duration: they are enduring in the wenxiangbei for the first two infusions, before vanishing entirely. Aroma is largely representative of the flavour: there is little complexity in the interplay between them (compared to, for example, zhuyeqing lucha, in which the grass notes of the aroma play well against a reedy, "yellower" flavour). 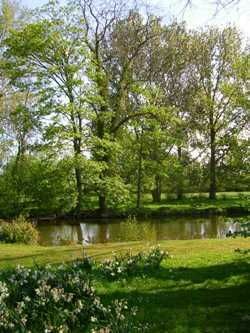 What we experience is straightforward, but definitely fine and pleasant. For complexity and depth, B shows more variety. The first infusion even has a brief lengxiang, of sticky-sweet candy. We particularly enjoyed the gradual and smooth evolution of deeper flavours in comparison to the more up-front, vigorous, and yet one-dimensional A. We look forward to experimenting further with infusing parameters, using the remainder of the samples, in order to better approximate that which a Japanese might enjoy from these refined and yet uncomplex leaves. A fast, yet deadly, review today. This shengpu sample was kindly provided by VL (proprietor of Tealogic) and originated from Royal Puer (TeaSpring's puer outfit). This is one of a pair of teas, the other being a 2004. This is allegedly from young spring Wuliang-shan tea, hence the "xiang". Method: 15cl shengpu pot; Caledonian Springs @ 100C; 1 rinse; 2 scoops of loose leaf. 2cm lengths; dark, with a few tips. A loosely-compressed section of an apparently iron-pressed (Xiaguan-style) bing. I have a strange passion for heavy compression; perhaps it's the gradual release in the pot, acting as a restraint on these energetic young leaves. Just two infusions. Tasting was interrupted, and not resumed due to overwhelming mediocrity. I'll be less cruel to this tea in subsequent sessions. Clear orange-yellow, with the straw-and-sugar beidixiang that one would expect from a tea with a small number of years of aging. 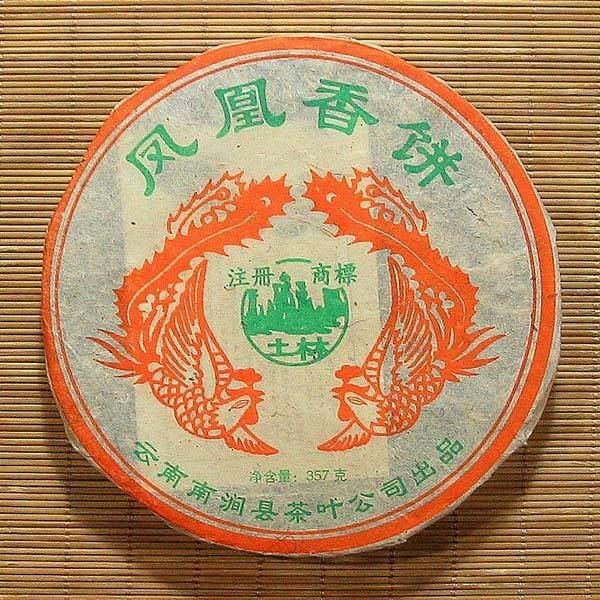 This isn't "xiang" in any respect, excepting a little menthol in the lid-scent. [Gaixiang? Maybe I can invent a term!] Very little aroma from the leaves themselves, which is surely a questionable sign. Quite sharp, with a touch of smoke. "I would say that it is very simple, but pleasant." Hmm. Definitely not unpleasant. This is as crushingly average as one could get, I think, precisely straddling the boundary between "good" and "bad". If I were being kind, I would say "a daily tea". Refreshing, drinkable, but with nothing to recommend it. It's great to be back. Google Analytics tells me that visits to this site increased while we were away, from 50 people/day to 70/day! You must be trying to tell us something. There truly is "no place like home". 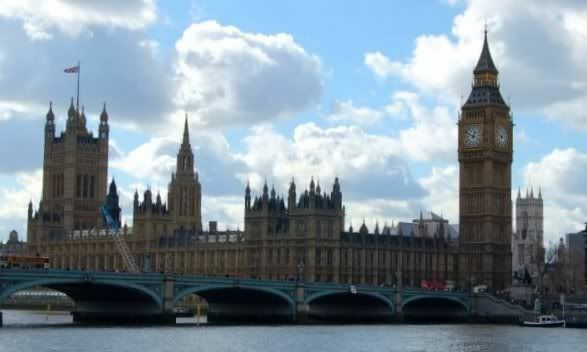 London is a foreign land, and is dirty, dirty, dirty. However, it's also the centre of culture and life as we know it in the UK, and so to its faults we temporarily turn a blind eye. While Xiaomao presented her paper at the conference, I took the opportunity to explore London. My quest was to find London's premiere gongfucha spot. It shouldn't be hard, given that (like the Internet) London is so large that literally all types of life and interest are represented there, somewhere. i) "Afternoon Tea"-style outfits: generally pretty hotels, serving the usual "English" teas, scones, and cakes. There are 6.02 x 10^23 outlets for tea of this kind in London - I counted. It's uncanny, being precisely equal to Avagadro's constant (to 15 significant figures). That's a lot of Earl Grey. ii) "Speciality Tea" outfits. Whittards is the prime example. Everything you don't want, scented and flavoured with every possible combination of additive imaginable. It's horrific, being the tea equivalent of buying wine from a petrol station [gas station]. Hit number 9,324 was "The Tea House", in Covent Garden (a traditionally interesting market area of central London). Making a few small concessions to gongfucha, in that they had a few teracotta replicas of yixing pots, I was dazzled by their array of... jasmine, rooibos, and Earl Grey. Sigh. They even had an "Earl Grey oolong", ironically enough, without actually selling wulong itself. Hit numbers 9,325 through 9,327 looked more promising. "Jenny Lo's Tea House". Started in the late nineties, it looks small and interesting... could they be the gongfucha I'm looking for in this city of faux Jane Austen high teas? Sadly, this turned out to be a restaurant/cafe. It has good reviews, yes indeed, but for their food. Again: sigh. Determined to find somewhere, something, anything of interest, my eyes pass onto hit number 9,328. "TeaSmith" - the web-site looks minimalist, and doesn't mention food. So far, so good. Could these be the droids we're looking for? A short ride on the Tube, and we're standing in the definitely trendy/experimental/independent climes of the Spitalfields area (nearest Tube stop: Liverpool Street Station). 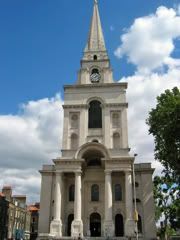 There's a famous church that directly overlooks the area (shown right), designed by Hawksmoor, who was very generous in his architectural contribution to Oxford. TeaSmith is a bijou shopette that looks at first glance like a bar with a row of tea next to it. It's very new, apparently trading since last November. Are we about to experience the familiar dread of blueberry pumpkin chocolate rooibos, washed down with a English Breakfast chaser? Thankfully not. Run by a friendly, knowledgable Scot by the name of John, it may be that London finally has a good teahouse. All this serves as a prelude to the part you're really interested in: the tea. It's pretty good. Via a sourcer in HK, John aims for small-farm leaves of a fine quality. Even his hongcha is long-leaf, which is a favourable sign. In the course of six hours spread over two days, I drank my way through a smooth dahongpao, a decent tieguanyin, a gaoshan longjing (apparently from Xihu, which was an unusual treat), a quiet dancong, a Korean green ("Sparrow's Tongue" - which I thought was mostly used for the name of 2nd-selection longjing), a remarkably unrevolting shuixian, and two shupu (one allegedly aged 10+ years, but it's so very hard to tell with shupu). Generally decent, and I like the commitment to small farms. The focus is very much on Guangdong and Fujian tea for wulong. Obvious omissions were my favourites (such is life): Taiwan wulong, shengpu, and hongcha. In fairness, John expressed an interest in finding a decent source of Taiwan tea. Shengpu is being deliberately shunned due to the "price bubble" - which is a bit of a pity. It's like a whisky shop not stocking Ardbeg, or a wine shop not selling bordeaux. The one hongcha on offer was apparently from gaoshan longjing, which was an interesting novelty. It was delicious, too. John indicated that he only stocks one hongcha as he believes it to be a type of tea created by the Chinese in response to the trade in Indian teas to the West. I know that this is true of Baihao/Oriental Beauty, but I am pretty confident this is incorrect for such classics as dianhong, qihong, and chuanhong. I asked for Xiaomao's opinion, to which she became uncharacteristically heated, as this is one of our favourite types of tea. What's your opinion, Reader? Xiaomao and I had been idly considering the idea of setting up a tea-shop in Oxford, perhaps a little more in the traditional gongfucha style. John's experiences in the capital were illuminating: it seems that London is just about ready for this kind of thing, and that includes most of John's work being converting and educating a generally unknowledgable public. And that's London. Other cities must surely be five to ten years behind this. If it's hard work for John in experimental, "Bohemian" London, it's an indicator of sure failure for such a venture in Oxford, which only has students 50% of the year, and has foreign tourists for the other 50% (who are all seeking quaint English tradition, rather than good tea). I find it instructive that John has also tried to gradually ease good tea into the public eye, making his shop look like a trendy bar, with a touch of Japanese tradition in the wall-furnishings and crockery: tea is served (via proper Yixing pots) in large (10cl?) bowls, and there's not a pinmingbei or wenxiangbei in sight. Several reviews rightly point out that the aim is to minimise the "cultural shock" for the English public by making it look largely familiar. Overall: an oasis in a London which is amazingly sparse in its population of real tea houses. The leaf quantity used was astronomical: I was shaking from caffeine intake after my third infusion of hongcha (first brew of the second day), and could barely pour straight. By the time I poured a shupu for one of the staff (fourth brew of the second day), I was shaking so much I poured it on her poor fingers. John prefers lower infusion temperatures, with a minimum infusion time of 30s - pretty different to most I've talked with. TeaSmith elevates this simple drink to the level of wine or chocolate. Once you've tried the good stuff, you may never want to go back to your usual cuppa. Thanks again to John and his staff for a good few days. 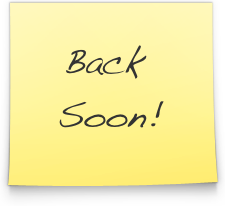 Xiaomao and I will be away until Wednesday, 19 April. 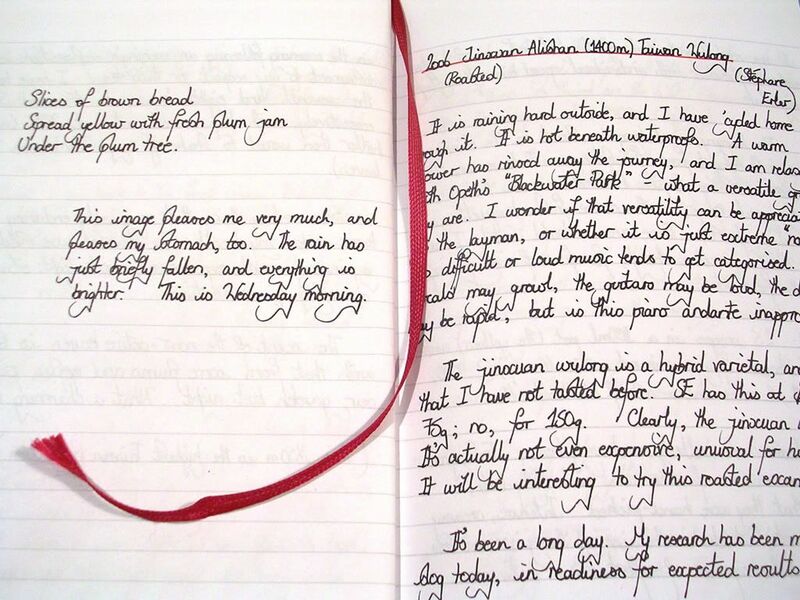 I should preface this entry, which will be the usual transcription process from my diary, with a brief introduction. It will deal with the Yi Jing (also known as the "I Ching"), and may provide a little background for those to whom this is an unfamiliar subject. If any find themselves in such a position, I very much pray that this introduction fuels your interest, rather than dissuading you from further investigation. Among its many functions, of which I shall not attempt to describe today, the Yi Jing is an oracle. One may question it, through a well-defined method that has survived for many thousands of years (literally), and receive an answer. So, then, we find ourselves to be on grounds which may be reasonably described as "superstitious". Though I have studied science my whole life, I do not believe in science. Rather, I do not believe in an outlook to life which is limited by science, for I believe that it is the very nature of science to be limited. By necessity, science is an abstraction of reality. Indeed: there are more things in Heaven and Earth, Horatio, than are dreamt of in your philosophy. I encourage healthy skepticism in all things. Buddha himself tells us not to accept anything that we cannot verify through personal experience. To the skeptic of the Yi Jing, I would counsel: suspend your disbelief, if only for a while. To that same skeptic, I would also hold up my personal experience of consulting the Yi Jing in its capacity as an oracle. I have consulted this book on scores of occasions throughout the past fifteen years that I have spent with it, and every time have been left sincerely taken aback by the appropriateness of its answer. Each and every time it answers, it does so with the voice of a wise sage who has an intimate knowledge of the very specific problem that I have posed. Thus, the Yi Jing may show us those truths that already reside within us, by virtue of the fact that all of life is contained within each of us: it is the proverbial string of pearls, each pearl of which is the string of pearls itself. And so, today's Yi Jing consultation. While quite a private practice, I hope that this article might prove interesting in being shared. The tea community is fortunate enough to lay claim to several Yi Jing scholars, to whom I hope that this entry will not appear too clumsy. I won't do them disservice of naming them here. Consultation of the Yi Jing typically requires the phrasing of the question in such a way as to allow the book to "speak" properly. It does not provide yes/no answers, but offers cautions and predictions which are usually specific and precise enough to the phrased question to be uncannily useful. It is very definitely not the Magic 8-Ball. "The Half-Dipper: what of its immediate future, and what cautions should be taken?" I use the Wilhem (1950) version of the Yi Jing, and now the Huang (1998) version as recommended by a fellow tea-drinker. The former provides a translation familiar to Western ears, whilst the latter is almost the perfect complement, being an excellent work by a foremost Eastern professor. To answer the question posed, we construct a hexagram ("gua") - a picture comprised of six lines, each line being "yin" or "yang". There are many methods of creating such lines, but the most traditional (and I believe most effective) is that of manipulating 49 yarrow sticks. We are fortunate enough to use those shown above, made by my father-in-law for the purpose. It takes approximately 10-15 minutes to create a hexagram using a series of numerical manipulations that I won't detail here. 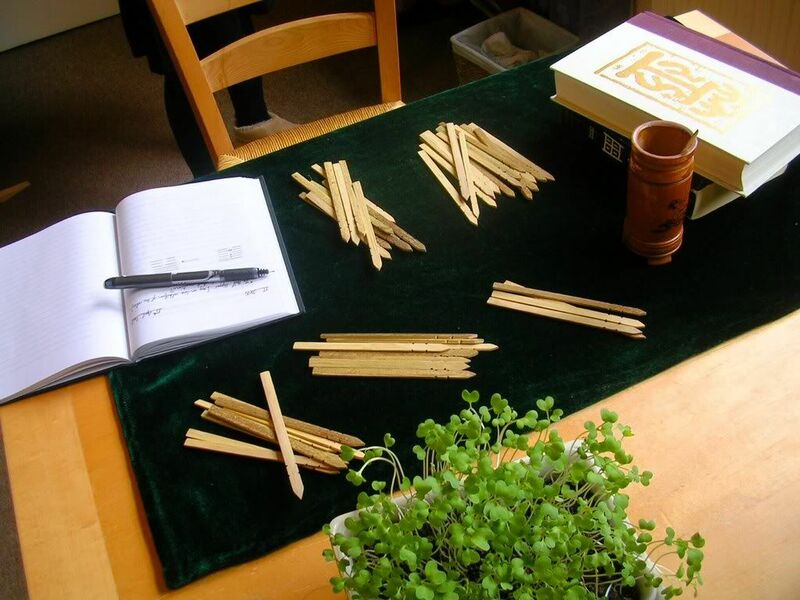 The more modern methods of generating a hexagram that do not use yarrow stalks take less time, but I believe that the time taken is an essential part of the process. It is the meditation that allows one to understand the answer - to hurry is against the spirit of the exercise, much the same as it would be to hurry through gongfucha. This hexagram represents the current state of the situation. It describes what is happening now, in relation to the question. Taoists believe that the world is in constant flux, and that change is the only truth. Each moment is an everchanging interplay of yin and yang, positive and negative, active and passive. The created hexagram is a product of the moment, and thus it is believed to be a "snapshot" of the current moment, characterising the moment's essence. We will see later how this hexagram that we have generated changes into another hexagram which indicates the next state of the situation. For now, let us see what the Yi Jing has to say about the current state, as given by the above hexagram. The book provides a number of texts for each hexagram - each of the possible 64 hexagrams has its own character. Thus, each moment is characterised by one of 64 prototypes. The genius of the book is that, somehow, the hexagram that is provided is specifically relevant to the problem. The text of the book is large, and layered like an onion. Each layer is attributed to various historical sages. The coremost text is provided by King Wen; surrounding that text is a layer attributed to Confucious (who famously stated "if I could have another lifetime, I would devote it to further study of the Yi Jing"). After birth, there is childhood. This hexagram, "Meng", at the time of the authors' writing, referred to the wisdom inherent in childhood that is waiting to be uncovered. It is the innocence of youth (what one source terms the folly of youth), from which wisdom can be coaxed through education and enlightenment. The themes of the hexagram are auspicious: the beginning of a life, the potential uncovering of wisdom. The first emphasised line symbolises the magnanimity of the teacher, in his providing something in the way of education. His magnanimity brings about good fortune. The teacher is ready to teach. The second emphasised line gives a note of caution: humiliation can occur if one loses touch with reality; isolation is a danger to be avoided. The third emphasised line indicates that the education is well-received. This also brings about good fortune. The student is ready to receive the teaching. Here we have taken the current state, Meng, and inverted lines 2, 4, and 5 (where the bottom line is 1, counting upwards to the top line, 6), in accordance with the original generation via the yarrow stalks. This hexagram represents a warning that stagnation may occur after the previous pleasant situation. A caution is given to avoid such stagnation: one must not seek, or become attached to, success. One must not strive for high position nor handsome payment, but remain true to himself. In doing so, by showing his integrity to his cause, potential calamity can be avoided. Thus, we have seen the current state, and the next state, relating to our question. The current situation is a very positive one. It is uncanny in that it has identified that a birth has recently occurred. It indicates that there is potential value waiting to be revealed. I cannot lay claim to Half-Dipper being a good educational resource, but if it provides useful to others, as well as being an electronic repository of my own notes, it will have served its purpose. This theme is provided by the text: the educator is willing, the student is willing - good fortune. It cautions that it must stay in touch with reality, specifically stating that to isolate oneself, to retreat into oneself, would bring misfortune. I have long held that some blogs are the ultimate in vanity publishing - I believe informative blogs, such as tea notes, are exempt from this criticism, providing a useful function. I very much hope that Half-Dipper can serve a function other than the pontification of the Self. A wise caution from the Yi Jing, indeed. The coming situation is a strongly-worded caution: one must not chase rewards or position, but remain true to original purpose. This is wisely said. Already, I have faced the temptation of being kinder to a tea in my transcription from my diary, softening my words, because I know that the vendor might be reading. In such cases, I have held true to my original notes, and aim to continue to do so. How wise is it for an endeavour to remain true to its purpose without striving for the vulgarity of reward? Critics of the Yi Jing have made the ill-informed comment that any hexagram can be interpreted to fit any situation, and thus it always appears to be giving good advice. I cannot concur, as a simple reading of the various hexagram shows their unique and individual characteristics. The power of the book, or the power of what it reveals working inside the human psyche through the lens of its accumulated wisdom, is that good, specific advice is (in my experience) invariably provided. One of the small joys of my life are those rare occasions on which I am fortunate enough to read the Yi Jing for someone else. For those still suspending their disbelief, thanks for bearing with me. After writing, I notice that VL has produced an interesting piece at Tea Logic, musing on the concept of change, while I have been working on this article. It just goes to show that there is no such thing as coincidence... As Jung himself would say, just more evidence for the synchronicity of life. As an undergraduate, I had odd tastes. Sometimes, people are kind and call it eccentricity. One such example were the walls of my rooms, covered in colourful prints by Dali - the arch-hierophant of surrealism. It was an interesting sight to behold through the ever-present morning mists of Bacchanalian torment. Do please click on the image to view the enlargement, if you're unfamiliar. As with most of Dali's paintings, it rewards close inspection. Of course, the subject is shown leftmost, the kneeling figure of Narcissus, looking down into his own watery eyes. 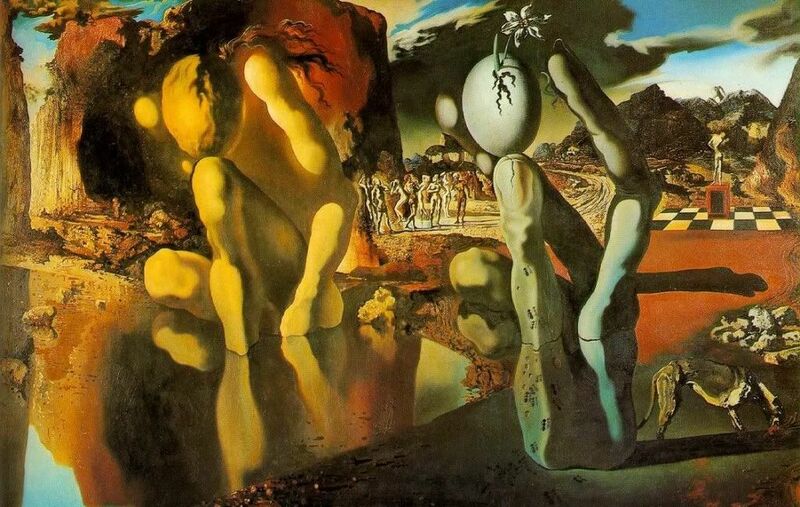 On the right is his metamorphosis, a stone hand holding a hatched narcissus papyraceus, echoing the outline of the infatuated boy in the visual playfulness so beloved by Dali (and his undergraduate admirers). A warning of the dangers of introversion, self-absorption, lack of humbleness. 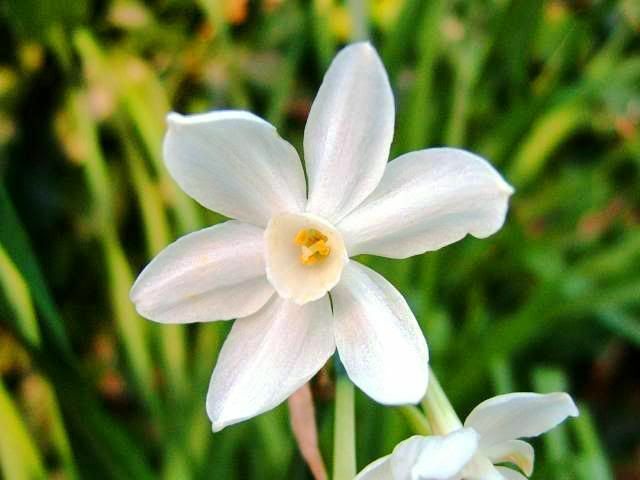 This entry concentrates on three shuixian, the Chinese narcissus, or "water sprite" flower. Fresh and crisp as the flower, or the self-centred indulgence of Ovid's myth? Three samples from Teamasters, Stephane notes that they originate from one Mr. Wang, a sprightly octogenarian with an apparent talent for roasting. Accomplished reviews of these teas have previously featured in the Teamasters blog, Teawarden, and Dodd's place. These teas are (a) 2004, (b) 1997, (c) 1992, appearing top-to-bottom, respectively, in the accompanying photographs. 10cl nongxiang pot; Caledonian Springs mineral @ 90C; 2 scoops; 1 rinse. (a) Long, twisted; typically sweet aroma. (b) 2cm dark and twisted - the norm. Usual nongxiang aroma. (c) Darker brown than its peers, mainly through the absence of the chocolate mid-browns. (a) Foaming from the rinse, this isn't the cleanest tea. Highly typical roasted aroma, with some charcoal, rapidly turning sweet in the lengxiang. Is this any different to all those roasted tieguanyin? Sourness. A powdery texture on the roof of the mouth. Quite bland. A simple, tangy roasted tea, with chocolate and malted bran in the aftertaste. (b) As SD noted, this is much more interesting than its younger brother. Spicy, sweet beidixiang, which turns into burned sugar. Straight medium-orange soup. Hidden by the ubiquitous roasting flavours is a light creaminess in the finish, which is very welcome. The overall midflavour is dominated by something approximating plain popcorn: a granular, cornlike flavour. Much better during the third infusion as the frustration of the roasting, which masks rather than complements, is drawn back. More gentle flavours begin to shine, particular the creaminess. Caramel in later infusions. (c) Pure orange, perhaps lighter than the previous two, which is contrary to expectation, given the darkness of its leaves. "A very thick texture, so rich." I have to agree; this has a higher viscosity and a smoother feel, perhaps a product of repeated roasting, or perhaps due to its maturity. "More rounded and smooth. Very pleasant, but not thrilling." A long, powdery roast - quite akin to the class of bed-time drinks based on malt. "More like tobacco, coffee." Quite satisfying in its smooth, gentle approach and delivery, but there is little complexity. The roast becomes less particulate, and more fine as infusions progress. It contrasts with the absurd roasting of the ever-horrific wulong from Whittards that we recently encountered. It seems hard to overbrew this tea; it is indelicate. The basic roast recedes around the third infusion, making way for something tasting a little more of the constituent leaf, which is enjoyable. A turning-point has been reached in potency, however, and we get the impression that it will be down-hill for the fourth infusion. I refuse to give up on this particular tea, however, simply due to its primacy. When this tea was being picked, I was completing my GCSEs at school, fifteen years ago. it would be a violence for this tea to come so far, over so many years, to be treated with disregard. And so, we drink. Slowly and patiently and attentively. 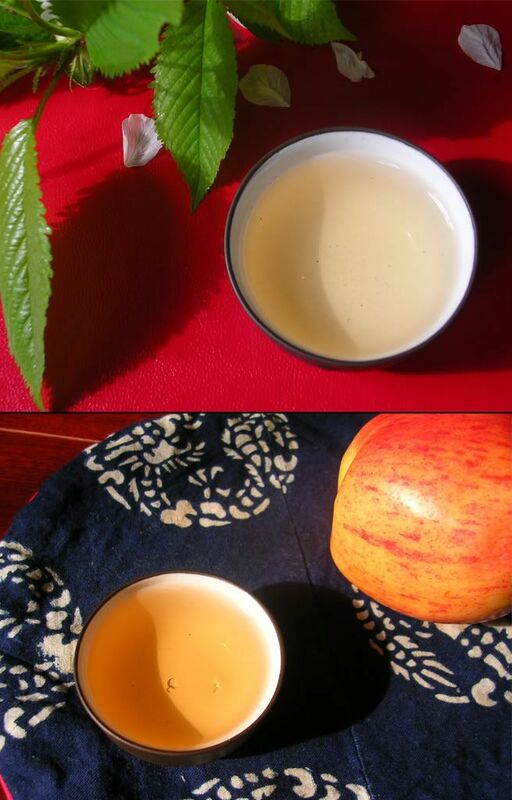 The fifth and sixth infusions retain their colour well, though the pleasant smoothness cannot carry it too far. (a) Long, dark, standard. A decent grade. (b) Uninspiring, but it is hard for me to be inspired by the appearance of nongxiang wulong, much like a shupu. No matter how decent, the final appearance is almost always minimally informative. (c) Quite whole, which is good to see for one so elderly. Not much integrity in the structure, which is perhaps to be expected after so many re-roasts. (a) Unremarkable. Note my bias against nongxiang wulong, however. This is priced fairly, being a "daily tea" priced at "daily tea" levels. (b) Decent enough, yet like so many others the roasting seems to homogenise rather than add character. I wouldn't like to see nongxiang wulong disappear, but I suspect that it won't be me keeping the tradition alive. (c) Better. Much better, in fact. The mediocrity of the 2004 has been smoothed, mellowed, enriched, and generally given the benefits of the gentle caress of the passing years. Could we only hope for such an effect upon ourselves. Worth keeping. So, then, introverted youth or delicate flower? These samples cover the spectrum, with the 2004 very much involved with itself, revealing little to us, while the 1992 is a gentle breeze, turned out towards us. Quite the variety of sensations. The coming together of shupu and flavours from the rice terrace - will it work? Cheese adulterated with pieces of fruit. Real ale made to taste like chocolate. Chocolate laced with oranges. Rooibos flavoured with cheese, real ale, chocolate, and oranges. These are crimes against the taste buds, usually covering up a mediocre base product. 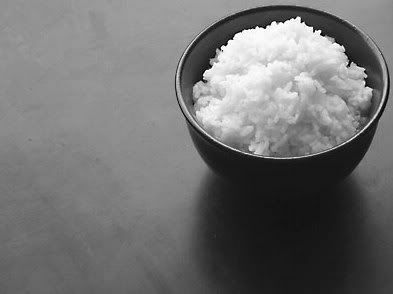 So, then, shupu with rice fragrance? Glutinous rice fragrance, we would imagine, from "nuomixiang". This is from the Chunming [spring-bright] tea factory, set up in the 90s in Kunming West Hills, and hails from Yunnan Sourcing. 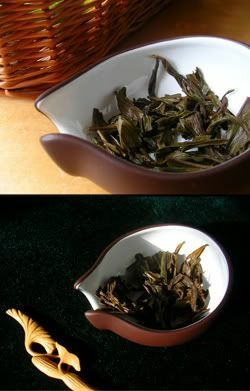 It's made from Simao-area (Fengqing) leaves, which Scott notes are fermented for 45 days and then left to dry naturally. At the point of compression into bingcha, they are steamed in cooked rice. It's very inexpensive - $12/bing. Many thanks to CB for this sample. Gaiwan; Caledonian Springs mineral @ 100C; 2 scoops; 2 rinses. Rice red-orange soup. It looks... like shupu. I'm not against shupu a priori, I should add, given the current anti-shupu climate, so my mind is open with regard to this tea. The initial aroma is, we agree, "fishy rice". The scent is long-lasting, and rather pleasant. The foretaste is smooth and low. A tangy mid-taste is a precursor to a late-arriving bitterness, that takes a surprising amount of time to arrive at the back of the tongue, but really digs in once it's there. It is definitely not unpleasant. The rice/fish effect sits in the nose. 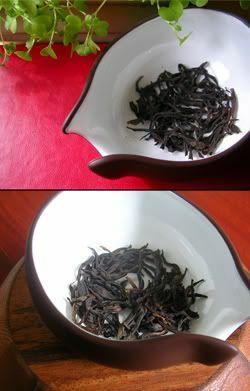 After reducing the amount of leaf in the gaiwan, the "fishiness" is greatly reduced, and the bitter final note is similarly weakened. As with many of these novelties (such as languiren, being dipped in ginseng and aniseed), the additive only lasts for the first few infusions - three, in this case. After that, it's the bold flavour of a decent shupu. It's not violent, but it is rather rich and seemly. It is stable all the way through the sixth infusion, and can clearly keep going long after we have tired. No prizes for guessing: dark, and gnarled. A decent shupu which has been blended with the rice flavour to a surprisingly good effect. The two sets of aroma and flavours are highly complementary; so much so, in fact, that we are decided to add a bing of this to our supply. The shupu itself is stable, gentle, and well-fermented - definitely going against expectation. It pays to be cautious with the quantity of leaf when brewing this tea. This is much more than just a novelty. Oriental Beauty. I could write a long time on this subject, and never get around to mentioning tea. 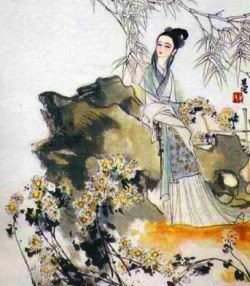 I shall limit myself to a single indulgence: Lin Daiyu, the tearful beauty from Hongloumeng (also known as "Dream of the Red Chamber", "Dream of Red Mansions", or "Story of the Stone"), pictured right. and will appear (a), (b), (c) reading left-to-right in the illustrations that follow. You should be able to click on them to see larger images (as indeed with most of the photographs shown in Half-Dipper). 90cl gaiwans; mineral water @ 95C; 2 scoops; 1 rinse. a) Amazing: twisted, long leaves of mid- and dark-brown, interspersed with many furry tips. Such an odd combination, yet so beautiful to behold. This tea is at the upper end of the oxidation scale (70%), making it approach hongcha in appearance, aroma, and flavour. Certainly, this is obvious from the lovely leaves of this tea. Perhaps to be expected, its aroma is akin to a light Darjeeling (which are notoriously being under-oxidised of late, making them approach Oriental Beauty). b) So colourful! Greens, browns, maroons, some almost purple, with plenty of bright white tips. A very floral scent, with cinnamon. c) Almost a 50-50 division between homogenous dark brown and silver. One or two tiny unprocessed leaves are present, still attached to withered stalks, which are flat green with red edges from the oxidation process. Dark, malty aroma. a) Orange-yellow, with a hint of green in the miniscus. Spicy currants in the beidixiang, very much like Christmas fig pudding! Tje long lengxiang is almost grapeskin. "The fruitiness of Chuanhong." A little like dancong, without much of a roast. The aroma is almost precisely that of Christmas pudding. Later infusions are backed with the power of the underlying tea: smooth, Irish cream. Fading around the fourth infusion. b) Rich yellow, with a hint of green throughout. Amazingly, this is reminscent of currant buns: sweetness and cinnamon combine to give a distinctly patisserie feel. A lovely sour-caramel lengxiang. "Very rosy." Later infusions see the dominance of the rosebud flavour. c) Paler than its sisters: the aroma is of musty sourness, as in elderly grapes. The flavour is dark and low, reminiscent of a gentle Assam. The flavour shows a lack of depth compared with that of the others. This tastes very "English". Endurance is good, lasting well into the fifth infusion. c) The 50-50 mixture is evidently split between firm tips and a fine larger grade. Christmas pudding vs. currant buns/rosebuds vs. assam. The Maoho (c) is particularly "English", and I wonder if Oriental Beauty's alledged original goal of appealing to the Western Darjeeling market is met in this tea. I prefer the colour and depth of the other two. Perhaps (a) and (b) are Daiyu and Baochai, respectively. ...which calls for a little more Hongloumeng to finish, I think. 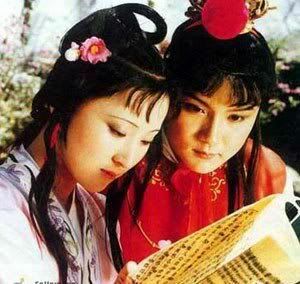 Here are Daiyu and Baoyu, from the popular old Chinese dramatisation. Baoyu: "Say, is that The Half-Dipper you're reading?" 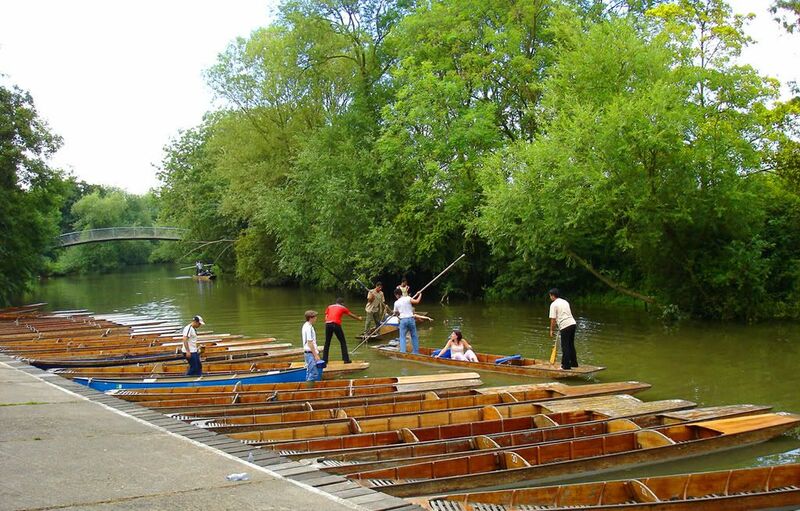 With the coming of Easter, so begins the local pastime of punting. It's a simpler version of Venetian gondolas, without the $500/hour price tag or the irritating singing. With the Easter visit of my parents, we took advantage of the unseasonably good weather, and drifted around on the river for a while. Watching the banks slip past gently on either side without much of a goal is rather akin to the tea spirit. Quiet participation. Today's tea is from Stephane's "Teamasters" venture, which I've found to be consistently excellent. It's from a 1400m plantation around Alishan (or on the mountain itself? 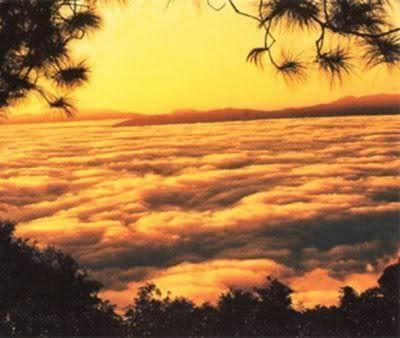 ), which makes this a "gaoshan" [high mountain] if one follows the definition of it being higher than 1200m. As is my understanding, the jinxuan variety (also "27-son") is one of the cultivars bred in the 1980s (the other being Cuiyu / "29-son"). 10cl qingxiang wulong pot; mineral water @ 90C; less than 2 scoops; 1 rinse. heavy balls of tea, a healthy mid-green. The light roast was the first aroma out of the sealed sample packet, though this is rapidly replaced by the pleasing scent of pure wulong once sitting in the chahe. Elegant and crisp soup, which is light yellow/green. A little fur suspended within hints at the presence of at least some young leaves. The aroma is very fine indeed: opening with a beidixiang of tasty butter, almost milkiness, it cools to a lengxiang of rounded brown sugar, as if from a newly-opened packet of muscavado. Classical wulong tending to the more leafy end of the spectrum are the initial flavours, with a delightful cooking-spice tang at the end, similar to powdered ginger. This spiciness lingers long in the nose; the aftertaste is very long, and pleasantly sour. There is something of smooth gingerbread, without the spicy heat. "The precise aroma of guihua [osmanthus flower]." The third infusion marks a turning point, and we have seen the best of this tea in the first two brews. The later infusions are a retreat into light, generic wulong flavours. "The guihua has withered, but there is still the coarse taste of the bush." Full branches, going back two or three stems, minus the tip system. These are up to 10cm-long branches! Leaves are the full range from second-grade 2cm all the way down to 6cm big leaves. They are all exceedingly soft, and lacking structural strength, reminding me of growing a plant without feeding it minerals. They crumble easily in the hand. Mostly whole, with some chopping around the edges. A fine initial flavour and spicy character, which are sadly short-lived. The lesser grade of leaves (apparently missing the tips) becomes clear as early as the third infusion, by which time the potency is fading quickly. A pleasant daily tea. It has none of the delicious texture and rarified finery of Stephane's Dayuling teas, but offers a broader, spicier, down-to-earth appeal. 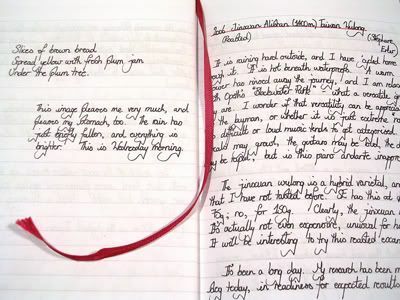 Having rooted around in my old photographs, I came across this diary entry from the previous encounter with this tea, in August 2006.